Terrestrial water storage (TWS) changes in global endorheic basins from GRACE satellite observations, April 2002 to March 2016. a, TWS trends (in mm of equivalent water thickness per year) for each endorheic unit. b, Monthly net TWS anomalies (Gt) in global endorheic and exorheic systems (excluding Greenland, Antarctica, and the oceans), and linkage to the El Niño-Southern Oscillation (ENSO) (right axis). TWS anomalies are relative to the time-mean baseline in each unit or system, with removal of seasonality. For comparison, 360 Gt of TWS equals to 1 mm sea level equivalent. 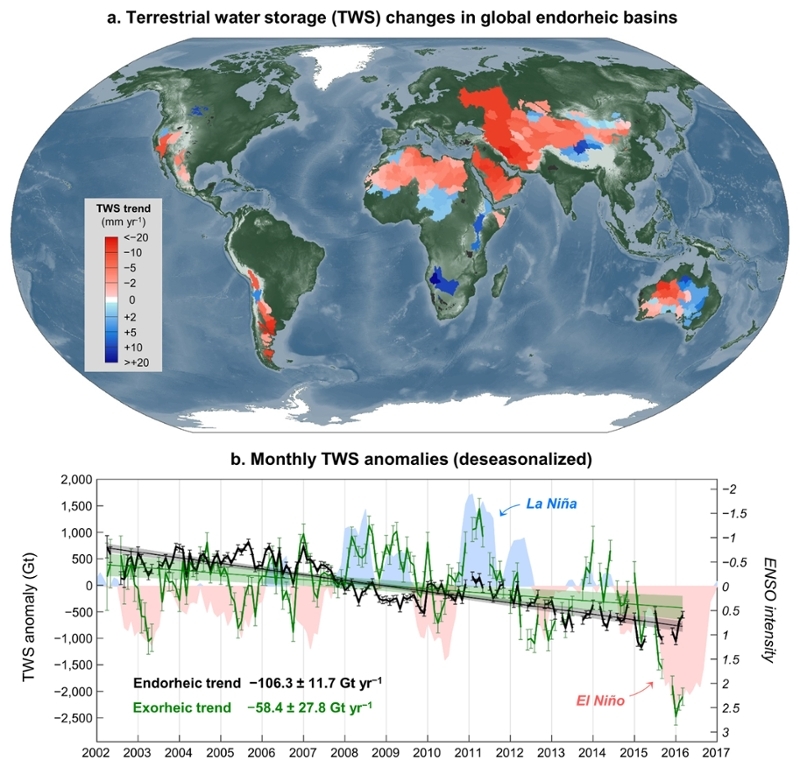 The study, "Recent Global Decline in Endorheic Basin Water Storage,” was carried out by a team of scientists from six countries and appears in the current issue of Nature Geoscience. "Water resources are extremely limited in the continental hinterlands where streamflow does not reach the ocean. Scientifically, these regions are called 'endorheic' basins," said Jida Wang, a Kansas State University geographer and the study's lead author. "Over the past few decades, we have seen increasing evidence of perturbations to the endorheic water balance," Wang said. "This includes, for example, the desiccating Aral Sea, the depleting Arabian aquifer and the retreating Tibetan glaciers. This evidence motivated us to ask: Is the total water storage across the global endorheic system, about one-fifth of the continental surface, undergoing a net decline?" Surprisingly, this amount of endorheic water loss is double the rate of concurrent water changes across the remaining landmass except Greenland and Antarctica, Wang said. Opposite to endorheic basins, the remaining regions are exorheic, meaning streamflow originating from these basins drains to the ocean. Exorheic basins account for most of the continental surface and are home of many of the world's greatest rivers, such as the Nile, Amazon, Yangtze and Mississippi. Wang noted that the signature of water storage changes in exorheic basins resembles some prominent oscillations of the climate system, such as El Niño and La Niña in multiyear cycles. However, the water loss in endorheic basins appears less sensitive to such short-term natural variability. This contrast may suggest a profound impact of longer-term climate conditions and direct human water management, such as river diversion, damming, and groundwater withdrawal, on the water balance in the dry hinterlands. This endorheic water loss has dual ramifications, according to the researchers. Not only does it aggravate water stress in the arid endorheic regions, it could also contribute to a significant factor of global environmental concern: sea level rise. Sea level rise is a result of two main causes: thermal expansion of sea water as a result of increased global temperature, and additional water mass to the ocean. "The hydrosphere is mass conserved," said Chunqiao Song, researcher with the Nanjing Institute of Geography and Limnology, Chinese Academy of Sciences, and a co-lead author of this study. "When water storage in endorheic basins is in deficit, the reduced water mass doesn't disappear. It was reallocated through vapor flux to the exorheic system. Once this water is no longer landlocked, it has a potential to affect the sea level budget." "We are not saying the recent endorheic water loss has completely ended up in the ocean," Wang said. "Instead, we are showing a perspective of how substantial the recent endorheic water loss has been. If it persists, such as beyond the decadal timescale, the water surplus added to the exorheic system may signify an important source of sea level rise." "Such comparable losses are, however, an aggregation of distinct regional variations," Wang said. "In endorheic Central Eurasia, for instance, most water loss came from the surface, particularly large terminal lakes such as the Aral Sea, the Caspian Sea and Lake Urmia, and retreating glaciers in High Mountain Asia." While glacial retreat was a response to warming temperature, water losses in the terminal lakes were a combined result of meteorological droughts and long-term water diversions from the feeding rivers. The net water loss in endorheic Sahara and Arabia, on the other hand, was dominated by unsustainable groundwater withdrawal. In endorheic North America, including the Great Basin of the U.S., a drought-induced soil moisture loss was likely responsible for most of the regional water loss. Despite a lesser extent, the surface water loss in the Great Salt Lake and the Salton Sea was at a substantial rate of 300 million tons per year, which was partially induced by mineral mining and diversion-based irrigation. “The water losses from the world’s endorheic basins are yet another example of how climate change is further drying the already dry arid and semi-arid regions of the globe. Meanwhile, human activities such as groundwater depletion are significantly accelerating this drying," said Jay Famiglietti, director of the Global Institute of Water Security and Canada 150 Research Chair in Hydrology and Remote Sensing at the University of Saskatchewan, Canada..
emeritus of geography, both from Kansas State University; Yongwei Sheng from the geography department, and Glen MacDonald, geography and the ecology and evolutionary biology departments, both at the University of California at Los Angeles; Fanny Brun from the University of Grenoble Alpes, Grenoble, France, and LEGOS in Toulouse, France; Hannes Müller Schmied from the Institute of Physical Geography at Goethe University in Frankfurt, Germany, and Senckenberg Biodiversity and Climate Research Center in Germany; and Yoshihide Wada from the International Institute for Applied Systems Analysis in Laxenburg, Austria. This research was supported by Kansas State University faculty start-up fund, NASA Surface Water and Ocean Topography (SWOT) Grant, China’s Thousand Young Talents Program, and the NASA Sea Level Change team. A portion for this research was conducted at the Jet Propulsion Laboratory, California Institute of Technology, under contract with NASA.